Any week that starts with Jim Rotondi sharing the stage with Rick Germanson, as well as a CD celebration with the Bad Plus, and ends with McCoy Tyner at Orchestra Hall is a jazz festival! And then there’s all the music in between! 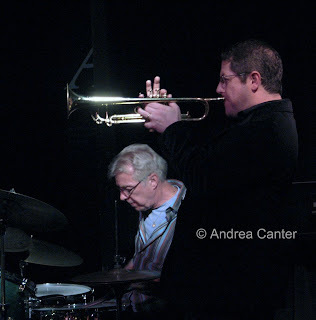 Rotondi, one of New York’s busiest trumpeters, and Germanson, a fast-rising star pianist currently touring with Pat Martino, are both favorite visitors at the Artists Quarter, appearing nearly every year. Having them together is a rare treat, and they will been playing in esteemed company with bassist Billy Peterson and drummer Kenny Horst this weekend (4/24-25). Another east coast visitor this weekend is sultry, bluesy, soulful vocalist Robin McKelle, who brings her band into the Dakota (4/24-25). Better known to European audiences, McKelle’s recent release, Modern Antique, proves that old standards are hardly “old hat” when given personal attention. McKelle gives old tunes a real facelift. Stick around after the Friday set for Late Night with Monk in Motian, now a sextet with double guitar, double sax, bass and drums interpreting Paul Motian’s interpretations of Monk. Maybe six degrees of separation but a lot of fun with some of the most exciting musicians in town (Scott Fultz, Brandon Wozniak, Zacc Harris, Park Evans, Matt Peterson and Pete Hennig). The Bad Plus expanded their repertoire and configuration on their latest release, For All I Care, adding local indie rocker Wendy Lewis as the fourth musician and tearing apart a raft of pop and rock covers, as well as reconsidering several modern classical pieces in their trio format. Ethan Iverson, Reid Anderson, Dave King and Lewis join together live at the Cedar Cultural Center Saturday night (4/25). If all rock had been presented this way in the 70s and 80s, I might have become a fan. Still, TBP interpreting Stravinsky is more my speed. Pianist/vocalist/writer/entertainer Ben Sidran returns to the Twin Cities after a long absence. He’ll be at the Dakota Sunday and Monday (4/26-27) with a couple of Petersons to give it a local shine. Another visiting vocalist, this one with Midwest roots, makes her Dakota debut Tuesday (4/28). Kelley Johnson is now based in Seattle where she has been a protégé of Mark Murphy and has recorded with such luminaries as Fred Hersch and Geoffrey Keezer. In between recordings she has toured with her quartet as ambassadors for the U.S. State Department. Her 2008 release, Home, is the work of a passionate storyteller with plenty of chops. Her husband, pianist John Hansen, will be here in support, along with Gary Raynor and Jay Epstein. It’s Duke Ellington’s 110th birthday this week and what better way is there to celebrate than with his long-time horn soloist, Johnny Hodges? Wednessday night at the AQ (4/29), Rick Carlson takes the Duke’s piano bench while Doug Haining will honor Hodges on sax and clarinet. 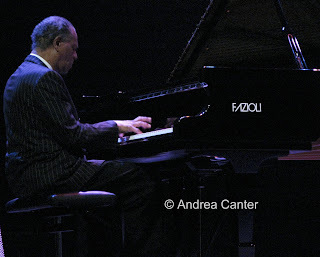 I saw McCoy Tyner and his trio at the Regatta Bar in Boston two months ago. I’ll miss the intimacy of a club setting but any chance to here McCoy is worthwhile. On Thursday (4/30), 70-year-old Tyner leads his quartet at Orchestra Hall; Twin Cities resident drummer Eric Kamau Gravatt, a long-time Tyner cohort, will be on stage as well. As in Boston, Gerald Cannon will be on bass and master saxman Gary Bartz will provide the hornlines. But the hero of the evening will be Tyner, one of the last performing musicians from the early bands of John Coltrane and now a legend himself. Often imitated, never duplicated, always accessible. If you can squeeze in more, The Dakota Trio (Tanner Taylor, Gordy Johnson and Phil Hey) are at the Dakota Wednesday (4/29); saxman Joe Smith returns to the AQ on Thursday (4/30) while Nancy Harms sings at the Dakota. Every Wednesday night, it’s the Wolverines Trio at Hell’s Kitchen (in the old Rossi’s space but with a better attitude). HK seems to be picking up some of the slack from the demise of The Times. Coming soon? Siamese Fighting Fish at the AQ (5/1-2); Brad Mehldau Trio, one night at the Dakota (5/3); Maud Hixson and Rick Carlson at the Dakota (5/4); Jason Moran and the Big Bandwagon in tribute to Monk at the AQ (5/9). 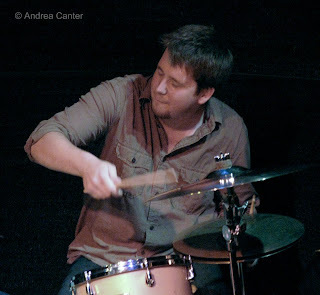 And if you are in Chicago next weekend like me, catch the Benny Green Trio at the “new” Jazz Showcase (4/29-5/4). The Twin Cities Jazz Festival has announced its headliners for June 19-20 at Mears Park in St. Paul—Alan Touissant, Esperenza Spalding, and The New Standards.